I woke up early to do my alone-time nature hike. It was a bit misty as I made my way through camp trying not to wake anyone. I walked the trail to Lake Mason thinking there was a decent chance of spotting a moose. Nope. But it was a peaceful walk and the little lake took on a different character in the mist. 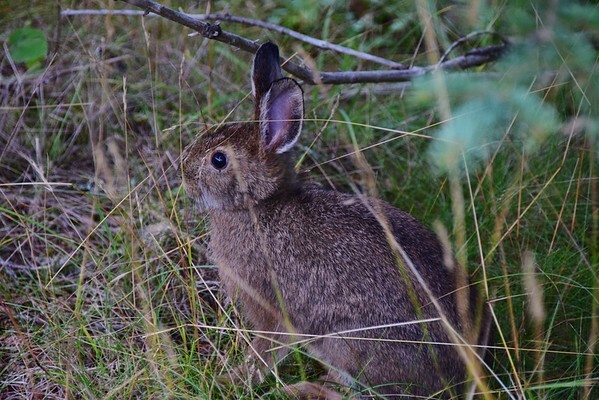 Other than the squirrels, I didn't see anything until I got back to camp where this Snowshoe Hare was feeding in front of our shelter. We heard from others that moose came through the camp around 4:00 in the morning last night and the night before, but they moved through quickly and only dark shadows were seen. We also didn't see any foxes that people warned us about. Josh had a fox encounter his first night in East Chickenbone campsite. He said he hadn't been there long when he looked up and there was a fox a few feet away. People said they weren't dangerous, but that they would just walk off with your stuff. Apparently, they will pick up anything and just carry it off. 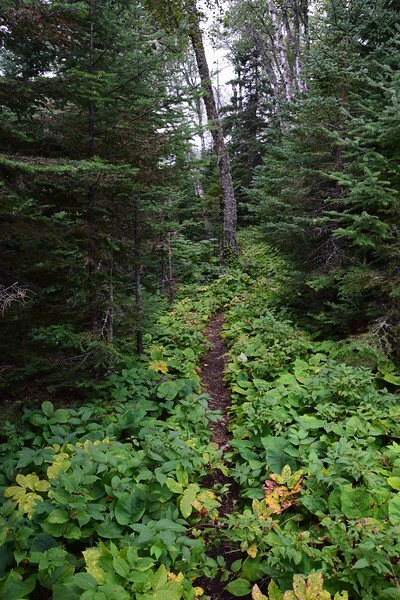 There were stories of campers chasing foxes to recover hiking boots and other necessities that were being pilfered. This morning our ferry, Voyageur II, was supposed to pick us up at 9:00 a.m. Now, though we were in Michigan, and the island is on Eastern time, the Voyageur II runs only on Central time to try to make things easier (for them, at least). We had our Cranberry Almond oatmeal, cleaned up and packed up well ahead of schedule. The ferry schedule said "boarding at 8:15" but it didn't arrive until close to 9:00. While waiting on the dock, I took a few more photos. The sun was trying to break through the mist. Everyone except Greg and Dave, the canoers, was getting on the ferry. We watched as they paddled out to begin another day of fishing. 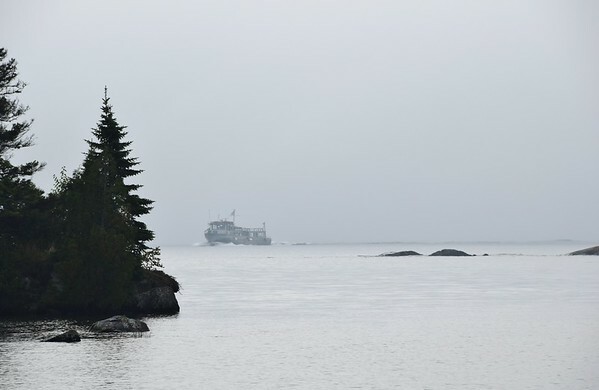 Eventually, the ferry appeared through the fog. We were NOT looking forward to the ride back to Windigo and then across Lake Superior to Grand Portage, where we were scheduled to arrive around 3:00 p.m.
Again we used the removable top portions of our backpacks to use as carry-ons. In addition to our Kindles and food, we brought our inflatable pillows - an excellent idea. We boarded and were thrilled to find several spots available in the lower, quieter cabin. In fact, we took the same seats we had on the trip over last Saturday. 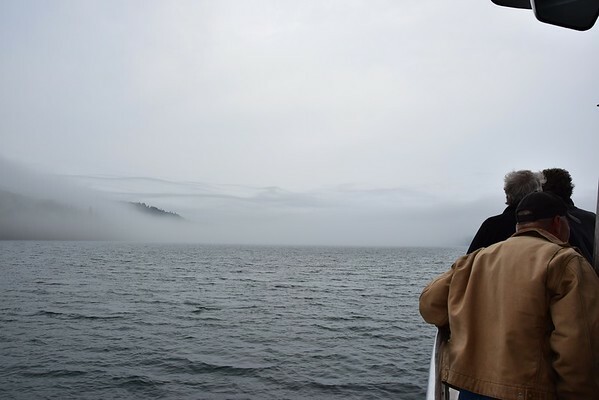 Once we were out of the shelter of Chippewa Harbor, it was too foggy to see, so it wasn't worth standing outside on the deck to watch the scenery. After some reading and short naps, we pulled into Windigo to drop off some folks and pick a few others up. We also had to return our camping permits to the ranger on the dock. Shortly after leaving Windigo, a huge fog bank rolled in. Then there was nothing to see for the next two hours. So we read and we napped and we ate the lunch we brought. 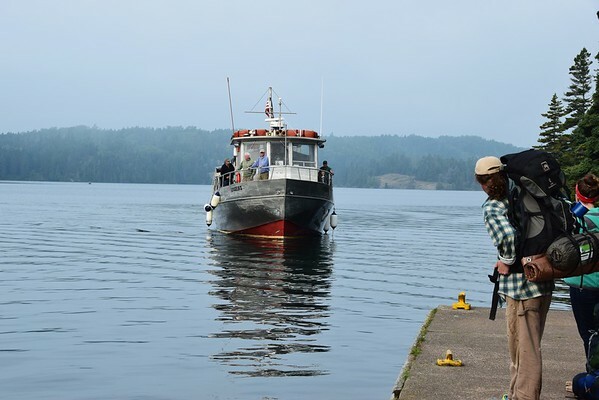 We were quite glad when the boat pulled up to the dock in Grand Portage. So, we got our backpacks, paid our $4 per day parking fee (cash or check only), and were on our way. We considered staying the night in Grand Marais as we weren't looking forward to the four and a half hour drive on top of the six hours on the ferry. But we were anxious to get back to the rig, so we headed home. 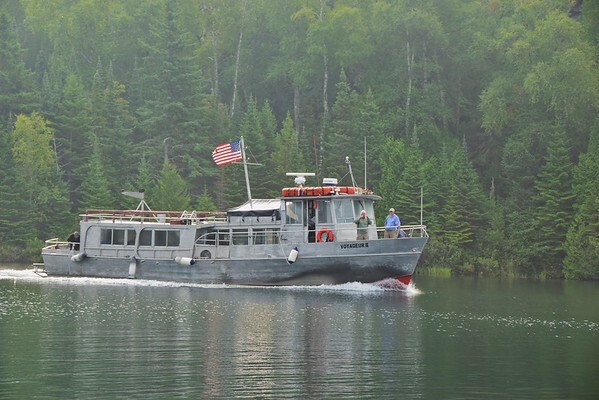 We enjoyed our time on Isle Royale. It was a great test for us, and a good taste of the National Park. Perhaps we'll visit another time, visit some of the highlights we missed this time, and stay a little longer. But I'm happy we took the opportunity to visit this lightly visited National Park while in the area, our 33rd out of the 59 U.S. National Parks. Thirty of our 33 National Parks have been in the last ten years as full-time RVers. 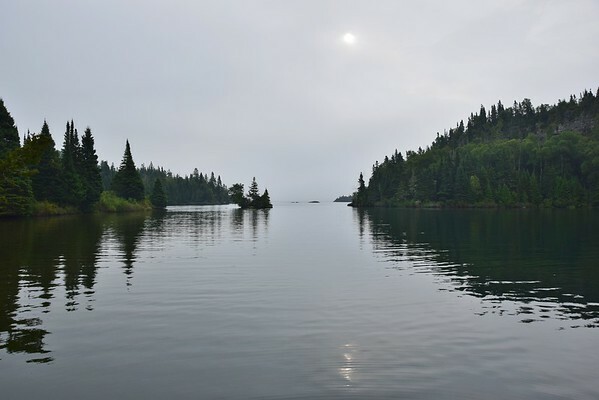 Isle Royale is one of the five LEAST visited National Parks, so we're glad to check it off our list as a visited National Park. We don't count them if we've just driven through them or by an entrance sign, and we often skip National Parks, even when in the area, if we don't feel we can give them their due attention. There are at least another ten parks we've driven past, with plans to return later when we can spend more time. 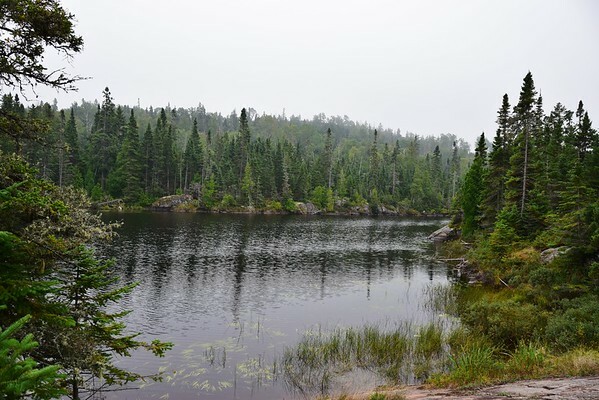 So, what did we learn on our second backpacking trip? First, we're pretty happy with our equipment. We haven't really tested the durability, but the functionality thus far has been great. Looking forward to more testing. Second, Linda likes backpacking more when there are people besides just me to talk to. As long as we keep the trips short and there are others to share the experience with, she will be more likely to go and enjoy. There you have it. 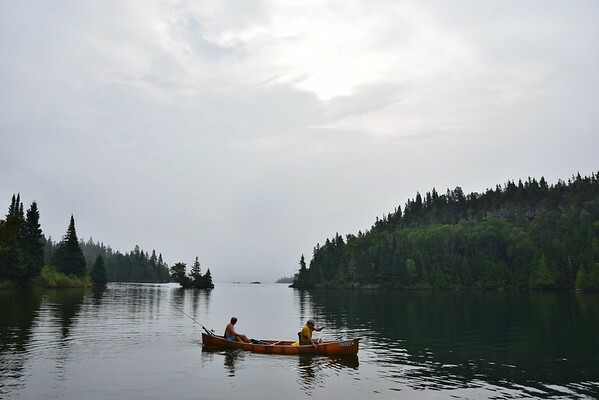 A nice, four-day, three-night trip to Isle Royale National Park. Although it wasn't the most challenging hiking, we got to experience much more than had we just done a day trip, and we had a great time in the wilderness.